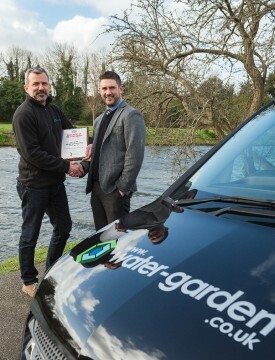 Otterbine Barebo Inc. has just presented the prestigious Contractor of the Year Award to Water Garden Ltd which they are delighted to receive as recognition for their continued efforts. Otterbine manufacture a wide range of lake aerators and fountains and Water Garden Ltd have achieved the No.1 slot for the highest UK sales for 2018. The award was issued by national sales representative Pete Newton, presenting to Water Garden’s Managing Director, Andy Staves. Pete has worked very closely with Water Garden and the team over the last few years, providing in-depth training to the Water Garden team alongside technical back-up from the Otterbine support team. He continues “Customers want to ensure that they are getting exactly what they need and are receiving excellent value for money with technical backup. This is exactly what Water Garden Ltd deliver and this award is a reflection of our ongoing efforts. We are extremely proud to receive this award and I’m immensely proud of my dedicated, hardworking team”. 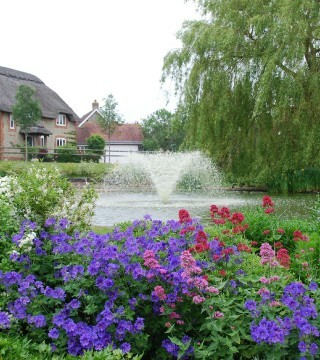 If you need guidance on Otterbine equipment or would like to discuss lake aeration or decorative fountains, please contact us on Portsmouth 02392 373735 or email us. We have a network of Otterbine-trained installers across the UK who can complete the installation for you, or we can operate on a supply-only basis if preferred. View our full range of Lake Management products here.